Las Vegas-based trainer Anthony Martin, who is currently in Cebu to witness today's huge "Pinoy Pride" boxing event at the Waterfront Hotel, believes that the fight between WBA junior welter champ Amir Khan and challenger Marcos Maidana should be a toss-up, but the guy who makes the wrong strategy is bound to lose by knockout. Martin, in an explosive interview with this writer, said that if Amir Khan opts to "fight" and not use his movement in the fight, then "he is definitely going down once he gets hit by Maidana." The Las Vegas trainer apparently knows whereof he speaks, having seen the sparring sessions between his ward Mark Jason Melligen and Maidana in Las Vegas. "Maidana is one solid puncher I can tell you that. 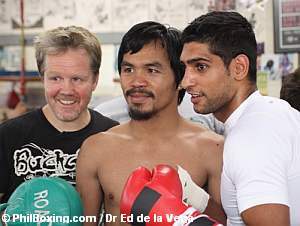 If Amir Khan engages, he's going down," Martin stated. "However, if Khan opts to use his brain and boxes, moves around, then he has a good chance of knocking Maidana out himself," added Martin. Martin, meanwhile, believes that his ward Melligen, who is seeing action tonight against Bladimir Hernandez of Mexico, "is the total package" although "we are not rushing things out for him." Martin, who said Melligen's sparring with Maidana and Floyd Mayweather Jr went well with his ward surpassing expectations, thinks that Melligen should be ready after several more fights, and if he wins impressively tonight, "sky is the limit." Melligen is promoted by Bob Arum's Top Rank, and managed by Michael Aldeguer of ALA Promotions of which Martin is the head of its international operations.